These amps puzzle me, why not just acquire a Fender 40 watt REAL tube amp with 2x6L6 's and a bunch of 12AX7's up front ? I get it that the Fender HR series is more expensive new ( and is 10 pounds heavier) but a used ONE fits the bill perfectly at around the same price or maybe less ! I thought the 50 /100 watt Katana was the king of the hill from Boss ? Now two more amps with a higher price tag. Seems to me Boss has a plan. There is no doubt that the target is the Fender 40 watt 2x6L6 /1x12 platform. My take on the Boss. It's A well known fact that boss pedals are the best. This amp is packed with boss effects. I've never understood why some Steelers carry in a big rack full of effects to make their steel sound right. I just purchased a Boss Katana 50-100 and I love it. It sounds like a tube amp. It has everything a player could want in a 32 lb package. the Katana amplifier is as good as any i ever played through. i have owned about all makes and sizes. I ordered the little (25 lbs.) Katana-50 on a recomendation from a friend. ( My Red custom shop Prosonics get heavier every year for some reason. ) This little amp is awesome, and if you're miked it will handle any sized gig, and you can forget the pedals.... there all in there. I've never understood why some Steelers carry in a big rack full of effects to make their steel sound right. 1) because we don't use the same amp at every gig. I personally own a dozen amps, 3 or 4 I may rotate for gigs depending on the venue. For certain I don't need a dozen amps, but as a steady working player I do need 2, 3 or maybe 4. They are tools. A Carpenter carries at least 3 hammers of different weights. 2) we don't want an amp filled with effects , we want the amp to do primarily what it is required to do. AMPLIFY. Another thought, if the effects in the amp were exactly the same, how could we get an amp for $300 new packed with effects and then find that each effect pedal independently cost approx $150 each ? Just for conversation, Behringer has a delay pedal for $25. It works. Not an issue. I have one. Other brands have delay pedals that start at $150. are we thinking they are equal ? I recently acquire a premium delay and parked the Behringer which I knew was temporary when I bought it. Quite frankly, even though it works, it was a waste of $25, an impulse purchase as I needed a new delay"TODAY". But it's ok. It's a spare. The new one USED was near $100. And well worth it. two premium Boss Pedals will be in the $300 range,are we thinking those are the same effects included in the amp at the +/- $300 price ? I'm not dissing the amp but the question remains. The amp has a nice feature set . If it works for a few than thats a good thing. But it's not a good thing for everyone. I'm personally not interested in any amp chock full of effects. The only add-on for any amp I buy would be reverb, and even at that I may grab an amp even if it does not contain reverb. Its about the amp, never the add on effects. An yep, I have a bag full of effects pedals that I may or may not use depending on the amp and situation. They are the tools of the trade. Oh yeah, what if your amp full of effects just happens to CxxP out on the gig, do you carry a spare ? Many here do, I do. A small portable SS amp with NO effects. TOOLS. It may not happen often , but ONCE is a lesson learned. BECASE PEOPLE WILL PAY $150.00 The thing is, once they have the circuit boards designed for each effect, how much would it cost to combine them in a multi-effects configuration? I think that for the individual stomp boxes, folks are probably paying about $148.00 for the case! I have a Katana 100 watt head and I like the on board reverb better than any amp I have ever owned. I do use my Wet Reverb pedal, but it costs almost as much as a whole Katana amp. Comparing the retail price of stomp boxes, to the quality of the effects they are using in their amps is pointless. That retail price includes profit, dealer markup,maybe even distributor markup, and the going rate for stomp boxes. The retail price has nothing to do with how much Boss has in the guts. There may be only $10.00 worth of parts if you don't count the casing, control knobs, and on/off switch. As a manufacturer, why would Boss want to design and build an inferior sounding effects module for their amps when they already have good modules for their stomp boxes that they can just use in the amps. That is pretty close to the truth---if you have ever built your own stomp box, you soon realize that the circuit inside doing the effect is only a very small part of the cost of the unit. It's A well known fact that boss pedals are the best. That's debatable. Some are real good. Some are pretty good. Some are okay. But many are junk. When I change amps I'm looking at what the amp itself provides in tone , volume ,eq and weight. Also the venue that I will be using it in. To me this is the engine that carries the load so I want the engineering of the amp to be exclusively for the amp itself. I believe that this is why amps like the Fender twin and its sisters have been around for years simply because the durability and tone was a top priority when the amp was engineered years ago. I searched the entire internet and could not come up with that well known fact. are they good ? sure, but not all of them. are some of them better than others ? Sure, but not all of them. we're out on a limb here. An amp chock full of effects is good for those who want that, but NOT good for everyone. Some of us spend ALL THE MONEY on a premium amp first. effects, come later, if at all. Nobody needs to understand why or know why. well of course the comment above rules out that Boss has multiple versions of the same effects. Some cheap some not so cheap. So which one is included in the amp ? All of them ? The cheap one or the premium one ? This is a silly discussion. Boss sells an overdrive for $49 new, a metal pedal, and a bunch of much higher cost more flexible OD , delays, reverb pedals etc, similar metal cases and clearly MUCH better pedals, Which one do we think is in the amp for $249 ? The question raised is why do players carry a bag of pedals. Its not understood why so it seems. Easy answer for me, I don't have or want a Katina ! I don't want amps with included effects. I don't even want to use a multi effects processor, of which I have a few. I choose the amps I want which fit MY needs and desires, of which my needs are for easily 3 amps, perhaps 4, based on the gigs I play. If the whole planet loves the Katina, great ! But it's not for me. I'll live on an Island with my Tube Amps along with my DV Micro 50. Evidently Boss agrees because they just came out with a new version of 40 and 80 watt amps to compete on the retail market. Why would they do that if the Katina 50 and 100 were the answer for ALL players ? easy answer, they are not, it's a dedicated market. Thats not a diss or a bad thing, just a thing. Peace and tranquility to all ! PS I'm using my new Aqua Puss MK II Analog Delay today for the first time. $100 used. I never thought it would "out perform" my Ibanez DE7 which died, but it did and does. I could tell the difference in a NY Min. I'm happy to carry it in a bag. You are right, Tony! This is a discussion that's gone on and on in every guitar forum, always with the same result - whatever works for each of us is the right way. I've had lots of individual pedals, but went to my trusty Boss GT-6 multi-effects years ago. I don't know if all the effects are the "best" or not. They work for me when I want to use them. Sometimes, though, it is easier to use just a couple of individual pedals. Tony is right in what we end up with. Most of us own and have tried multi effects units and some love them. I too have several. Seems after the honeymoon is over we go back to the tried and true of a single amp and a pedal or two. Must be a reason for this. Amps loaded with effects are fine until you get that glitch and scramble on a dark stage to get a back to your settings. How many of us carry a backup plan? I know I do. Just my 2 cents. I like the idea of hauling as little as posssible. I know its a different price point, but I like the Telonics idea of including an extra rack space for the rack of your choice. Having them program the unit with cool presets and providing a great manual is the bomb. I’m not a “rack guy” but this is an exception. 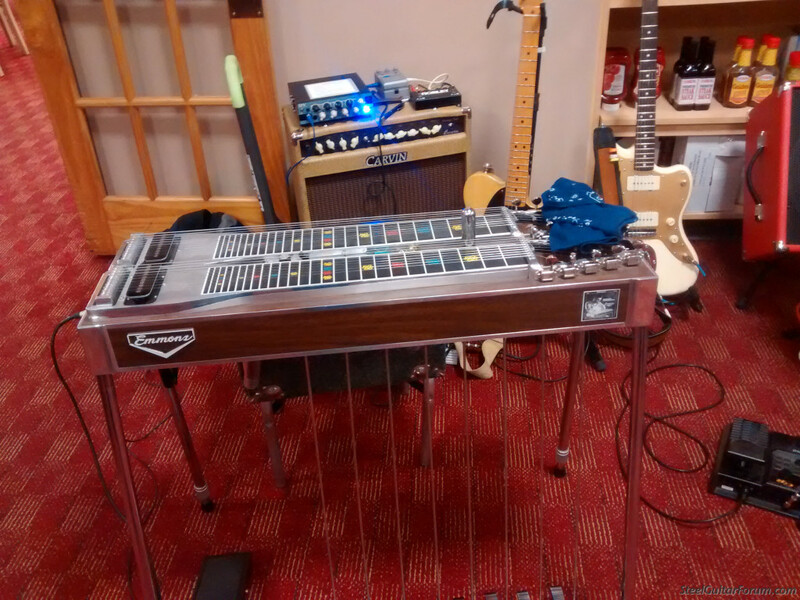 I also liked the steelaires ability to power a stomp box. You could mount it on the back ledge of the cab, ( a mini single unit like a delay, or in the cab ) and still throw and go. I just cant warm up to the idea of extra gizmo boxes on the floor. I need to get in and out quickly most times, often in the dark, and need to have as small a footprint as possible. Not sure how I’d like the Boss, but I understand how the concept could be attractive if you like the onboard effects. I also don't like stuff on the floor. I typically use a delay pedal and an AB. Both are on the amp directly behind me. I do depend on amp reverb. My foot print , like Steve's, is very small. My estimate of time to setup and put away these two units is probably 2 min or less. In this photo I'm am using the DV 50 , which is an extra item in the gig bag, but lately I've been using the Carvin 50 watt tube amp or a Fender 40 watt Blues Deluxe . Both similar. Whatever amp I use must also have an ext ext speaker out, as I have a cab on the opposite side of the room as well. Total load 4 ohms. I purchased 2 amps recently. A beautiful, all tube, hand wired boutique VHT (made in USA before they went Chinese too). And a BOSS Katana 100. As different as can be. The VHT has no reverb or anything, only 18 watts. I use a stomp box reverb from GFS. I them mic it with a 57 for stage use. Low volume it sings. We shall see how the Boss stacks up. It'll be fun messing with it. Is that pronounced "Nex-tone" or "Next-one"? Personally, I'd rather have my EFX in the amp. Most players don't like this because they just plain don't work and sound as good as separate boxes. My gigs are very loose and unstructured, however, and practically no one on stage or in the audience can tell a $100 reverb pedal from a $350 one, especially once the band kicks into warp drive. Of course, if you're recording, or playing with only one or two pieces, small improvements in the sound can be lots more noticeable. That's why it's always important to know what it is the player is using his rig for. How many of us have been to a steel show, and heard players with just a combo amp and a reverb pedal that had a better sound than some guys with a big rack setup and a dozen pedals? It's also good to keep in mind that we get hired or complimented based on what others think of our sound, not what we think of it. We've probably all had gigs where we thought we sounded like crap, but others were really impressed, and times where we thought everything sounded fabulous, and no one noticed. Some pros have even commented about their sound on a recording or through a house system being really different than their "true sound". We can't control everything, so sometimes "good enough" is just the best we can expect. I don't have anything against effects IN THE amp or cheap vs expensive, for me I rotate a few different amps so external is my preference. The only prerequisite I have is amps need to have there own reverb , be it good bad or ugly. I think Katana amps use the roland COSM effects suite. These are standard on their synths and cheaper multi effects pedals. They're good but most people don't think they're top of the line BOSS. So for instance, I have a BOSS MD-500 which is a $300 multi effect pedal using higher bit rate processing than COSM and dedicated higher end DSP hardware. It sounds better to my ear. The katana concept makes sense in many ways but it would be hard to argue that the on board effects at least are top of the line.